Good morning, dear friends! I hope that this winter’s day finds you safe and warm. It has been quite cold and gloomy here in Oklahoma. I’m so ready for some glorious sunshine! Today, I am joining several blogging friends to bring you a Cozy Winter Home Tour. This fun tour is being hosted by the sweet Amber at Follow the Yellow Brick Home. A list of all of the homes are at the bottom of this post. If you just came from Carol’s house at Bluesky at Home, I am so happy that you stopped by for a visit. I chose to share my master bedroom as part of the winter home tour. We have been busy adding a few finishing touches to make this the perfect cozy winter’s retreat. Mr. Bleu and I were in dire need of a new mattress. The purchase of a new mattress called for a new bed and a few other decor items to complete the master bedroom space. When looking for a new bed, I took into consideration the style of my home. My home is decorated in a traditional French country theme with a little English country influence. Therefore, I don’t like things that match. I prefer for my decor items to compliment each other and look as if have been collected over time. I adore decorating with antiques and family heirlooms. The bed I chose was an iron one that would mix well with my other pieces. I still adore my red bedding so I chose not to change it. When we purchased our home, these custom curtains were already here, and they were a perfect match to my bedding. I recently added this writing desk to a corner of my room. I am really enjoying the area, and it is the perfect spot to enjoy a book with a cup of tea or work on some paperwork. Pretty red roses help to perk up the room on a cold winter’s day. I found this antique Italian Salon Chair during a recent visit to Inessa Stewart’s store in Dallas. She has two glorious showrooms packed with beautiful European Antiques. The other store is located in Baton Rouge, Louisiana. If you ever have the chance to visit one of these showrooms, it is a must. She has so many pretty things! I adore candlelight during the winter months. My candles of choice are Luminara flameless candles. They are so realistic looking, and you don’t have to worry about the dangers of a live flame. During a recent visit to my favorite consignment shop, I found this wonderful Staffordshire lamp. The shade was a little plain so I simply hot glued some pretty trim to the top and bottom of the shade. Our television was originally hanging on the wall, and it drove me nuts! It was my goal to find a French armoire to place it in. One weekend, when Mr. Bleu and I were visiting an estate sale, I found this beauty for an unbelievable price. I was so excited! It was just the perfect thing to conceal our television. Another great find, at the same estate sale, was this Charles Faudree settee. It was in mint condition and the fabric was so pretty! It was just the thing to add additional seating to the bedroom. I have been busy as a bee nesting after the holiday season, and I have so much more to share with you. The dining room is getting a makeover with a new paint color, and the living room is getting some changes, too. In addition, old pieces of furniture are getting some love with new upholstery. I’m sorry I have been absent since the holidays. It has just taken me a while to get back into the groove. I hope that you will stop by for another visit. Have a marvelous Monday, sweet friends! Next up on the tour is Virginia Sweet Pea. Shannon, your master bedroom is beautiful and is a definite cozy winter retreat. I love the iron bed and of course, your bedding is so pretty. The desk was a perfect find and the Italian salon chair is so lovely. I am swooning over the Charles Faudree settee, it is beautiful. I can’t forget to mention the stunning armoire, you have acquired some gorgeous pieces my friend! Have a wonderful week! Thank you, sweet friend! I hope that you are enjoying your Monday!!! Definitely a cozy retreat and I love the colors! Enjoy your start to the week!! Thank you so much for the sweet words! I hope that you are enjoying your Monday!!! Your bedroom looks so relaxing and cozy. I love your new lamp, armoire and settee! Shannon, your bedroom is lovely. I love the toile pattern and the red, just beautiful. Your armoire and settee were certainly great finds. Your Staffordshire lamp is a beauty and the trim you added to the shade is your gift of attention to details Also, I love the beautiful floral painting. You have created a room which is such a lovely retreat. Have a great day and week, my friend! Thank you, sweet friend! I hope that you have a lovely week!!! Such a lovely cozy retreat! Your armoire and settee were gorgeous finds! So glad I found you on Instagram and your blog! Your bedroom is so lovely Shannon, your furniture is gorgeous! It sounds like you have been busy busy, January is such a great time to redecorate and organize. I want to paint and redo my master this spring…you are inspiring me! Shannon your French style bedroom is so lovely, I feel like buying toile fabric and flower artwork now! So pretty! Your master bedroom is wintery, inviting and so stunningly beautiful that it works right into Valentine’s Day! I love the new French armoire too – oh my golly it’s fantastic. I’m all for hiding the TV’s. Not a good decor look. LOL. Thank you, Cecilia! Enjoy your week!!! I am loving your bedroom and how you have it styled. The french armoire is a beautiful piece. Thank you, Terrie! Enjoy your week!!! The red bedding is wonderful – I’m a sucker for red. That settee is absolutely fabulous. Thank you, Carol! I am so glad that you love red, too! I hope that you have a wonderful week!!! What a beautiful and inviting bedroom. I love your red, so pretty. Thank you, Marty! I hope that you have a wonderful week!!! Love your new bedroom. I added the same red bedding to our bedroom. I wouldn’t think of changing it. I think that it will be fine for summer and winter. Thank you, Gina, for your sweet comment! I hope that you have a wonderful week!!! What a lovely Cheery room, just makes you want to write a letter, or curl up and read a book on the settee. Such a smile you gave me here! Thank you, Sandi, for your sweet words! Enjoy your week!!! Shannon, You picked out the perfect bed for your home; it fits with your decor so nicely and is a nice balance to all the wood. With all the red, it looks like a lovely Valentine room! Thank you, Lora! I hope that you have a wonderful week!!! Your bedroom is so pretty! My first thought when I started reading your post was, “Yeah! Color!”. I don’t blame you one bit for keeping those gorgeous red curtains that the previous owner of your home had made. They are so pretty and your rug and red and white bedding look so good with them. I also loved seeing your pretty furniture. Your new tv armoire is a beauty! Thank you, Paula, for your very sweet and kind words! I am glad that you love color, too. I hope that you enjoy your week!!! Hi Shannon! I’m new to your blog, found you through another one but I’m so glad I found you! Your style is right up my alley! That’s so strange you finding that Charles Foudree sette because I’ve been devouring his books lately, lol! It’s gorgeous by the way. And that armoire, I’m so jealous! I’ve been looking high and low for one I can afford and those do NOT come cheap! Yours is fabulous, what a find! I also just bought some of the Staffordshire dog figurines today, so it was so neat to see them on your desk. I can’t wait to see more of what you post and I’m so happy to have lucked up on your blog! Have a great week! Shelia, I want to thank you for your very sweet words. 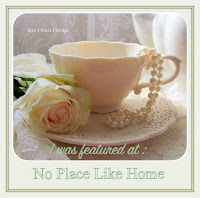 I am so happy that you have found my blog and share the same decorating style. I have several of Mr. Faudree’s books, and I read them often. In fact, I have purchased several of his items at estate sales and local consignment shops. He decorated lots of homes in my area, and his items can often be found. However, I don’t understand how anyone could possibly part with them! I hope that you find an armoire. Mine appeared when I least expected it, and you wouldn’t believe me if I told you the bargain I received. Again, thank you for your kind comment, and I hope that you have a wonderful week!!! Thank you, Valerie, for your sweet comment! The painting is called “Roses from a Victorian Garden” by Albert Williams. I purchased mine online from Great Big Canvas. If you watch, they have sales often. I hope that you enjoy your week!!! Shannon, I absolutely love your bedroom! The settee is beautiful and the armoire is beyond gorgeous! Unfortunately, my husband loves watching tv too much and the one in our bedroom and living room are sticking out like a sore thumb. One of the things I’ve had to put up with for over 50 years, LOL! Thank you, Carol, for your sweet words! You made me laugh when talking about the tv! I hope that you have a wonderful week!!! Just recently discovered your blog and I’m loving it! Beautiful bedroom! Would you please share the paint color and brand on your walls? Nancy, you are so sweet! Thank you so much for your kind words. The paint color is straw by Benjamin Moore. I hope that you enjoy your week!!! Shannon I am in love with your whole bedroom decor!!! How dreamy! I love all of your finds! That armoire, lamp and settee are fabulous. How amazing that the curtains matched your bedding when you bought the house. It was meant to be! You have created a wonderfully cozy space for winter but I know it is lovely year round. I love your floor too! Thank you so much for joining our hop. Stay cozy sweet friend! Thank you so much, Amber, for your kind word and for also allowing me to be a part of your blog hops. This has to be the sweetest group of girls! I always have so much fun! Have a wonderful week, sweet friend!!! All so pretty my friend! I love your new bed and your design style! I agree that I love a look where things look collected over time! Excited to see the other projects you have been up to! Thank you, sweet friend! I hope that you have a wonderful week!!! Looking at the pictures you post of your home, I am reminded of the goal I reach for in my own home:. It should look as though I love everything in it! You seem to have accomplished that in your home. It is always a delight to receive your blog. Sylvia, you are so sweet! Thank you for your kind words. I couldn’t agree more…you should only surround yourself with the things you love! That is what makes a house a home. I have never been one to subscribe to trends. That is just not who I am. I hope that you enjoy your week!!! Be still my heart……that glorious armoire!!! It totally makes the space. Sure you don’t mind that TV now! I love your bedding….the entire winter room! Thank you, Christy, for your sweet words! I hope that you have a wonderful week!!! Shannon, I have a question I unrelated to this post, but about another post. Did I see that you used a brown paint to “stain” a chair that you had found at an estate sale or consignment shop? If so, would you please share the product that you used? My husband made a sturdier shelf to hold a TV in our armoire, but it needs to be painted to match or blend in with the other shelves. Thanks! Hi Teresa, I am so sorry that I am so late to reply to your question. I did spray paint the two chairs that I found at an estate sale. I can’t remember the exact color I used, but it was a wood tone. The brand was Rustoleum. I hope that you have a wonderful week!